Joyful bearded father talks with the child. Bearded dad and his son lying on the white carpet. Father-child relationship. Fun daddy counts money. Father-son relationship. Happy smiling dad and his joyful son lying at the fur carpet. Father-child relationship. Father-child relationship. 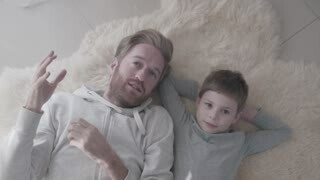 Joyful father and son having fun lying on a white fur carpet playing with money. Entertainment dad and child. Father-child relationship. Slow motion. Bearded dad and his little son lying at the white fur carpet and have interesting emotional conversation. Father-child relationship. Joyful bearded father talks with the child. Bearded dad and his son lying on the white carpet. Father-son relationship. Bearded dad and his little son lying at the white fur carpet and have interesting conversation. Father-child relationship. Bearded father talks with the child. Bearded dad and his son lying on the white carpet. Father agrees with the child. Father-child relationship. Father talks with the child. Bearded dad lying on the white carpet and his son sitting next to him. Father-child relationship. Playful beard father sitting with his son at the carpet and holding money. Dad and kid put a finger to the nose. Joyful daddy counts money. Father-son relationship. Bearded dad is sitting with his little son at the carpet. Father agrees with the child. The boy counts money. Father-son relationship. Young bearded father talks with the child. Bearded dad lying on the white carpet and his son sitting next to him. Father-child relationship. Playful beard father sitting with his son at the carpet and holding money. Dad and kid put a finger to the nose. Father agrees with the child. Joyful daddy counts money. Father-son relationship. Bearded father and little son sitting near the window on the couch in large living room and play on tablet. Daddy teaches his kid to use gadget. Happy dad and child. Father-son relationship.